If media reports are to be believed, Mourinho is on the verge of getting the sack. 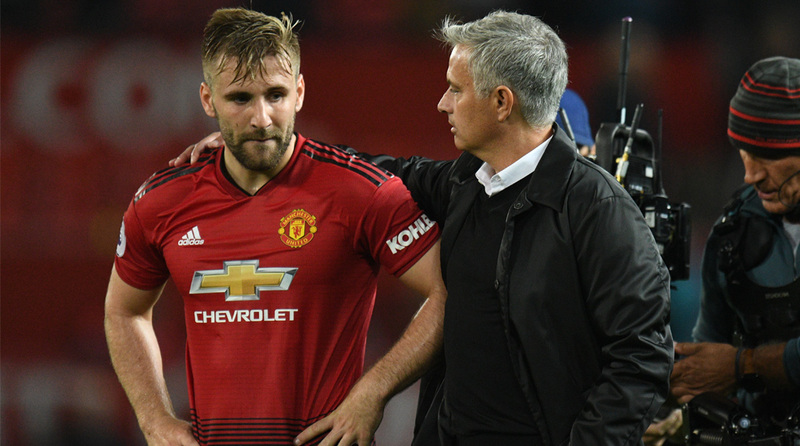 Manchester United suffered a heavy home loss on Monday night at the hands of Tottenham Hotspur, which led to many fans calling for manager Jose Mourinho to be sacked, but defender Luke Shaw has apologised to the United faithful and promised them that better days are in store. United laboured to a 2-1 home win over Leicster City on the opening day, but since then things seem to have unravelled for the Red Devils. They were stunned by Brighton & Hove Albion on Matchday 2, but worse was to follow as Spurs thumped them 3-0 at Old Trafford to leave them six points off the top after just three games played. “You look at the first half and I think we were outstanding. We had a lot of chances to put the game to bed. Of the chances we had, (we should have scored) maybe one or two, then for me it would have been game over,” Shaw told MUTV after the tie at Old Trafford. United did actually dominate Spurs in the first 45 minutes, but with Romelu Lukaku missing an absolute sitter, the sides went into the interval deadlocked. The first corner for Spurs yielded the the opener and before United could react, Lucas Moura capitalised on a defensive mixup to put the visitors 2-0 ahead. Reportedly, star players like Anthony Martial and Paul Pogba are unhappy with Mourinho’s management, but Shaw insisted that the Portuguese manager still enjoyed the support of the dressing room. Shaw was the sole player to get lauded by Mourinho in his post-match interview and the left-back has been among the few shining lights for the Manchester giants in what has been a dismal start to the season. “A big thank you goes to the fans for the way they supported us, even when we were down 3-0. It was amazing,” he continued. Despite Shaw’s insistence, it appears that Mourinho may be one loss from the sack. The Red Devils visit Burnley on Sunday for the final game before the international break and should they fail to secure maximum points from their trip to Turf Moor, the Special One may well become the Jobless One. Frenchman Zinedine Zidane is the bookmakers’ favourite to replace Mourinho in the Old Trafford hot seat. The odds have significantly shortened after the Portguese had a remarkable meltdown in his post-match press conference on Monday night.